Harvard President Drew Faust delivers her speech during the Harvard Center Shanghai celebratory banquet and reception. Intellectual inquiry and practical action were both on rich display at “Harvard and China: A Research Symposium,” a series of lectures, panels, and break-out sessions held to mark the official opening of the Harvard Center Shanghai on March 18. The symposium attracted faculty and administrators from across Harvard, and explored multiple dimensions of China past and present, from its emerging rural health care system to crisis management to “architecture and urbanism” in Shanghai and beyond. Nearly 300 attendees from the Harvard community, including many alumni living and working in the region, attended the conference, as did more than a dozen Chinese dignitaries and several journalists. The Harvard Center Shanghai, which occupies an entire floor of one of the newly constructed skyscrapers in the city’s Pudong section, is the first such presentation and research space of its kind outside of Boston and Cambridge, and represents an important next stage of the University’s long engagement in Asia. The center is intended to serve as a locus of research and teaching activity, and while its creation has been spearheaded by the Harvard Business School (HBS) and the Harvard China Fund, it is specifically intended as a resource for Harvard faculty, students, and alumni across all of Harvard’s Schools. For Harvard Business School, the new venue will serve multiple purposes, most importantly, enabling it to explore a range of potential activities in support of its research and teaching programs. The Harvard Center Shanghai will operate under the direction of the HBS Global Initiative, which also oversees international research centers in Latin America, Japan, India, and Europe. Each center has an executive director who leads a team of case writers, all of whom are fluent in the language of the host country and familiar with its customs, companies, universities, and governments. Harvard Graduate School of Design alumnus David Tseng (left), M.AR. 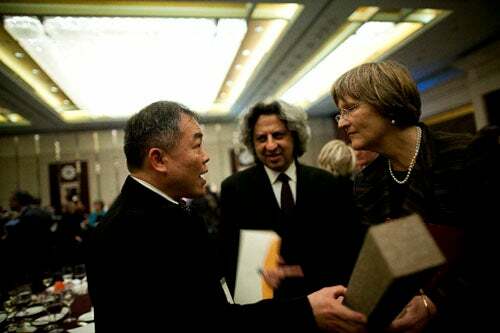 ’87, greets Harvard President Drew Faust (right) and GSD Dean Mohsen Mostafavi at the opening of the Harvard Center Shanghai. Tseng is a professor and dean of the College of Fine Arts and Creative Design, Tunghai University, Taiwan.